In Part 1 of Unpacking Cultural Myths of the Modern Workplace: “Stress as a Status Symbol,” we looked at the true cause of the stress epidemic, the history of workaholic values in America, the vicious cycle that ensues when chronic stress is left unchecked, and a few tools to help turn things around, retrain the brain, and reduce stress while increasing personal success. Unlike “Stress as a Status Symbol,” which shows up in our behaviors, the next modern workplace cultural myth shows up in the form of advice. If your jaw just dropped to the ground, bear with me for a moment. I am a huge fan of personal growth, and I agree 100 percent that we must challenge ourselves if we hope to succeed in all areas of our lives. We enjoy a tremendous amount of growth potential in the moments when we can tolerate the discomfort of learning new skills, taking on new roles, and pushing ourselves to reach new heights in our careers. However, in order to be executed successfully, personal growth requires certain skills and tools. Without these, the uncharted landscapes outside your “comfort zone” quickly become a slippery slope toward burnout. This slippery slope is evidenced by articles such as Amy Morin’s “There’s a Hidden Dark Side to Being an Entrepreneur — It Can Wreak Havoc on Your Mental Health,” which pulls back the curtain on the community’s best-kept secrets: depression, low self-worth, anxiety, and addiction. I realize that not all SUM Innovation readers identify as entrepreneurs, and you might be thinking, “OK, sure, but that’s not me.” Honestly, I hope depression, anxiety, addiction, and low self-worth aren’t realities you currently face. But don’t be fooled: Just because you aren’t an entrepreneur doesn’t mean this can’t happen to you! Because “leaders and entrepreneurs are programmed to ‘never show weakness,’” Feld explains, those suffering from depressing face “much more pressure to keep it hidden and suppressed.” I suspect this is true for most ambitious professionals, regardless of their leadership and entrepreneurial aspirations. “Break out of your comfort zone” constitutes a cultural myth because it is incomplete and sloppy advice. “Comfort zone” means nothing! This phrase is intended to encompass an individual’s personal version of familiarity and normality. Of course, something being familiar and normal doesn’t make it comfortable. Similarly, not everything unfamiliar and novel is uncomfortable. Using comfort and discomfort as measurements to determine whether you are backpedaling, standing still, or moving toward success is ineffective and confusing. Plus, comfort isn’t the bad guy! Think about it. Do you really want to make discomfort your driving force? Of course not. You want to be successful so that you have access to comfort: comfort in knowing that you are healthy and resourced, that you have made a meaningful contribution, have made your parents proud, have provided for your family, or have built a beautiful and pleasurable life for yourself. Instead of the term “comfort zone,” I suggest the term “window of tolerance.” What is a window of tolerance, you ask? Personal development, peak performance, and leadership development, which are vital to professional success, all require a solid mental health foundation. Your window of tolerance is that foundation. When you operate inside your window of tolerance, both positive and negative life experiences activate eustress, aka usable stress. When you are in a state of eustress, you perceive challenges instead of threats and rise to the occasion. However, if you “break out” of your window of tolerance, positive and negative life experiences activate distress, aka dis-ease. Yes, disease! Instead of learning and growing, you are fighting, fleeing, or freezing. If you have ever heard anyone refer to “fear of success,” this is the neuroscience that explains the phenomenon. Certain life experiences — even if they are positive — overstimulate our nervous systems and make it difficult for us to self-regulate. This overstimulation causes distress. If left unchecked, it can create self-sabotage or lead to burnout. Unlike the vague “break out of your comfort zone,” which comes with an overwhelming slew of random suggestions about how to get “uncomfortable,” expanding your window of tolerance can be accomplished by following a specific formula. Step 1: Write your “cultural orientation summary” so you can clearly map your existing window of tolerance. Your window of tolerance is informed by your cultural orientation, or what ideas, beliefs, environments, experiences, etc., have informed your version of familiar and normal. This explains the phenomenon of culture shock. The cultural orientation summary is the result of information gathered by a series of questions designed to help you get clear on your cultural influences and gain insight into what may and may not be tolerable, familiar, and normal for you. So many insights can be gained from getting to know the whos, whats, wheres, whens, and whys that make up your window of tolerance. For example: What types of people are you used to interacting with? What types of people may be less familiar? Where have you been in your life? Where haven’t you been? How does this inform your social and environmental preferences? What might be some foreseeable challenges for you in regard to environment? When were you born? When do you do your best work? How might these realities support and challenge you? The insights are endless. Step 2: Start to track the presence of somatic markers for eustress and distress. Now that you are more aware of what types of people, places, and things are familiar and may activate eustress versus distress, you should start challenging yourself to try new things, exposing yourself to experiences that can expand your window of tolerance. Pay very close attention to what happens in your body and mind when you try new things. Does it feel good or scary? How do you know? Are you feeling regulated? Are you experiencing hyperarousal or hypoarousal (see image above for more details)? What is your breathing pattern? What is the tension level in your body? What sensations are you aware of? These details are called somatic markers, and they serve as clues that will help you pace yourself as you expand your window of tolerance. Step 3: Practice the ABC Centering Technique in the face of stressful stimuli. As you track your physical experience and learn more about your somatic markers for the physiological states of emotionally regulated, hyperaroused, and hypoaroused, you need a tool to self-regulate if you enter a space of hyper- or hypoarousal. A great tool for this is the ABC Centering Technique. ABC stands for “awareness, breath, and centerline.” This technique acts directly on the nervous system to help you reestablish homeostasis after a distress response hijacks you. When you use this technique, you will convert distress into eustress in real time, and in this moment your window of tolerance will expand and make room for a new normal. Basically, you are reassuring your nervous system, “I got this. We got this. You don’t need to fight, flee, or freeze. 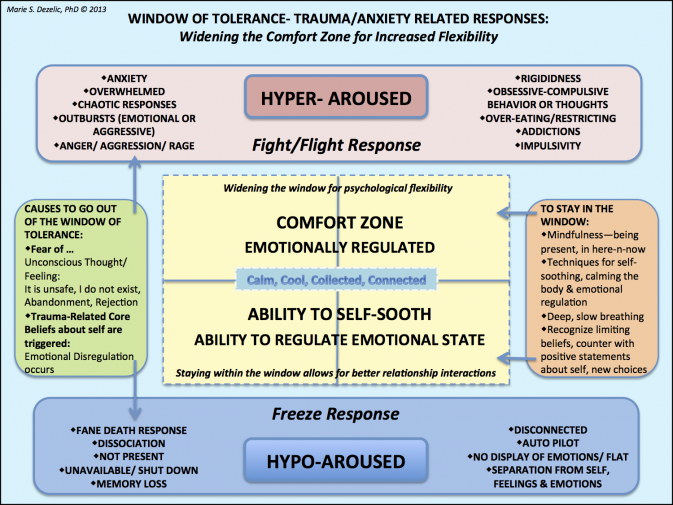 We are safe even though we are uncomfortable!” This allows your brain to create a schema (neurological mind map) that links the new experience to the window of tolerance and eustress instead of hyper- and hypoarousal and distress. The more you practice, the more natural and automatic the regulation process will be and the more expansive your window of tolerance will become. This is personal growth in action, literally! These resources will help you bring this formula to life so that you can start experiencing massive shifts and achieving maximum results right away.